It’s hard for me to believe, but I don’t even have a baby in the house any more…my youngest is now three (sniff). But I’m still super excited about a new book that applies time-tested nutritional principles to feeding little ones, Super Nutrition for Babies: The Right Way to Feed Your Baby For Optimal Health. This is the book I wish I’d had when my first baby was born! I went with my gut and learned enough to muddle through, but oh how much easier it would have been to have it so clearly laid out for me, with all of the additional information provided here! Written by two mothers who also happen to be a certified nutritional consultant and a board-certified pediatrician, Super Nutrition for Babies lays out the concept of “protective nutrition”-a mindful way of nourishing children to safeguard them from modern-day illness and to preserve their chance for genuine health-using the four criteria of digestibility, purity, immune-boosting, and nutrient-worth. Much of the epidemic of chronic conditions like asthma, allergies, learning disabilities, automimmune disorders, and more, among young children today (referred to in the book as the “3Cs”: Contemporary Chronic Childhood conditions) are directly linked to the toxins and nutrient poor food common in today’s world. We need to be proactive about our childrens’ health, and diet is one of the most significant factors we can control. The authors explain that the 3C conditions, although they vary so much, have two very important things in common: they are caused or made worse by both nutrient deficiencies and toxic overload-both environmental factors. Now, thanks to the Human Genome Project and the field of epigenetics, we know that the genetics we inherit are not static – the environment makes much more difference than we ever realized, influencing how the genes we are born with are expressed. And since we have significant control over our babies’ environments, we can have a great influence on their health, even if they have genetic susceptibilities to the 3Cs. So, one of the most important things we as parents can do for our children is to optimize their diet, and starting in infancy will give them the foundation to continue healthy habits throughout life. Super Nutrition for Babies is one of the best tools I’ve come across so far to facilitate this. The chapters progress from birth to 24 months, addressing each of the pillars in turn. For example, the critical factor of digestibility is discussed in relation to the introduction of baby’s first foods at 6 to 8 months. Did you realize that the first digestive enzymes your child’s body produces are those for digesting protein, fat, and cholesterol? So why on earth do most first foods consist of grains and vegetables, which their little bodies aren’t capable of digesting properly? These are foods that do not provide proper nutrition and actually detract from the nutrients your baby needs for growth, development, and detoxification. They aren’t digestible, pure, immune-boosting, or nutrient worthy, and include most processed foods. These foods are often staples of the Standard American Diet. They’re convenient, easy to come by, and inexpensive. In a healthy diet, the occasional OKAY foods won’t pose a problem, but they don’t provide adequate nutrition. You may be surprised by some of the foods listed in this category! These are clean, digestible, nutrient rich foods that are important to incorporate into your child’s diet as much as possible to support the serious nutrient needs of the body, and aid in cognitive, neurological, immune, and physical development. These foods go a step further than PURE foods. They’re digestible, pure, immune boosting, and nutrient worthy. They not only nourish, but can protect and even regenerate and restore health! They’re literally the “superheroes” of the diet. Super Nutrition for Babies outlines how to provide an age-appropriate diet consisting of mostly POWER and PURE foods, while allowing the occasional OKAY food and avoiding the CRAP foods. There’s a wealth of recipes, fascinating scientific and medical information, and encouragement. I loved the vintage baby food ads scattered throughout the pages…it’s amazing to see how much things have changed in the last 50 to 75 years when it comes to baby-feeding philosophies! In the back of the book is a great list of resources for further information and another of sources for food, supplements, ingredients, equipment, and more. Even though my kids are all past the baby stage, I’ve learned plenty of value from this book, and you can bet I will be giving it as a shower gift and saving copies for my children to use with their own children some day! I consider it an essential resource. In fact, I’m going to give two copies away to two of you! Follow the directions below for multiple chances to win! 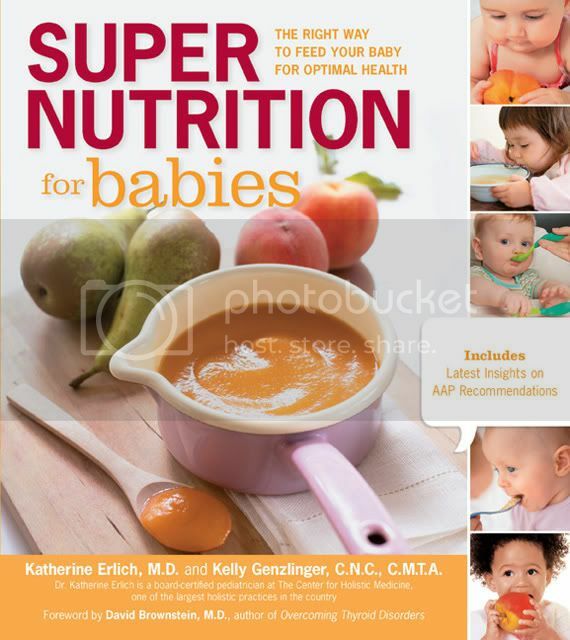 Thanks so much to Fair Winds Press for generously providing me with two copies of Super Nutrition for Babies to give away! Linked with Monday Mania, Real Food Wednesday, and Fight Back Friday. I'd like to win this book because I'm about to have a new little baby! I also have a 3 and 4 year old. It would be fantastic to win this book to help me better understand how to feed my son! I would love to have this as a reference. I already try to feed my daughter optimally, but I'd like to have it written out better so that I can remember and share it with others. My baby is three months old and I would love to learn about the best food for him! I'd like to win a copy because I'm expecting my first- I've been a WAPF member for a couple of years and feel I have a good handle on how to eat as an adult, but not a solid grip on how to translate it in to feeding an infant. baby girl just turned 3 months and I want to make sure I am prepared to feed her REAL food when she starts solids. I know eg yolk is a perfect first food, what else? I'd like to win because i have a 1 year old baby girl and I am very interested in reading this book. I would like to win for ideas on baby food making. I have been preparing my little ones food and would love more info! I ave a new baby ah home that I will be making homemade baby food for. My sister is having a baby in September. I think this would be an awesome gift!! kristiedonelson(at)gmail(dot)com Thank you. Shared on Facebook. <a href="https://www.facebook.com/kristiemorrison.donelson/posts/321605464600774https://www.facebook.com/kristiemorrison.donelson… />kristiedonelson(at)gmail(dot)com Thank you. I would so love to win this book to give to my sister-in-law!! I'd love to win for when our first arrives! I will be having kids in a year and I want to be knowledgeable. I am a new mommy and would love to have this. I'd like to win so that I can gift it to my little sister who is expecting. i would love to have this book for myself.